When you do something you’ve never done before, sometimes, you just have to “feel” your way through it. And it’s one thing to buy a new house, or a car, or change jobs where you are, but when you’re preparing to do all those things in a country 6,000 miles away, the concept takes on a whole new meaning. Today, Dana and I find ourselves 42 days out from a move that includes all those things and much more. For the last five months, we’ve worked long-distance with Gary and April Scarborough at www.laspalmasecuador.com to buy property and build a home from the ground up in Puerto Cayo. It’s a matter of days now, before the home is complete, and for the most part, it’s been easier than building a house where we were on site. I see Rosetta Stone sitting on your desk. 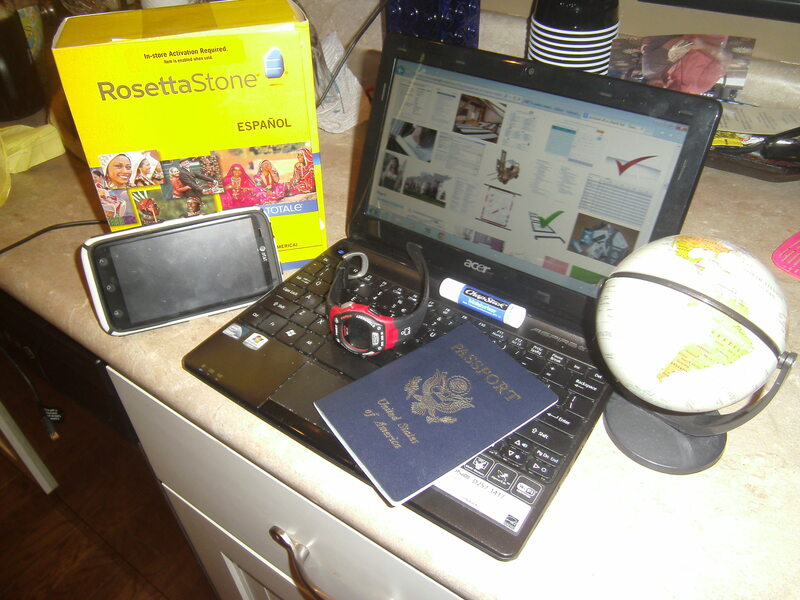 May I suggest you deep six Rosetta Stone for learning Spanish (Latin America type) and look into Radiolingua.com. A world of difference between the two and for me Radiolingua.com (and that is their complete URL; no “www”) was 100 times better preparing me for a lengthy trip thru France. I’ll sure check into that. Thanks for the tip. Having a family meeting tonight with our grown children to talk about the potential of life in Equador. Planning a trip there in the coming year. Thank you for the info! That’s awesome, Rhonda! Just let me know if I can help. There are hundreds of things I wish I’d known BEFORE I went, and then again when I hit the ground. You’re making the right decision by investigating now. Prices are only going up. AND anything you do now is a huge investment. Not that we believe everything we read, …but I’ve read that property values will likely increase 5 to 10xs over the next 5 years. I’m really excited for you guys. What airport would you fly into to get to Puerto Cayo? Guayaquil is preferable, an will leave you with a 2.5 hour drive by rental car. Quito fares can sometimes be cheaper but leaves you with 2 alternatives- a very hard 8-hour drive, OR, a domestic flight via Tame or Aerogale to Manta, then a 45 minute drive to Cayo. On your first visit DO NOT attempt to drive in Quito or Guayaquil. Get a rental car and pay a taxi drive $5 to lead you out of town and get you going in the proper direction. These towns have 3 and 7 million people respectively and there are no driving rules. I’m not kidding.